Bridesmaids are one of the most important part of the Wedding ritual. Your best friend is getting married, and you are a Bridesmaid. Your sister is getting married and you are her bridesmaid , but you are clueless about how to do your hair. Bridesmaids enjoy a special position in weddings and it’s your special day too. Whether it’s a common hairstyle all of you are planning to do or if are looking for a unique design to stand out from the crowd we have a collection here of some pretty Bridesmaid designs that will surely help you choose the best design for that special day. Messy Buns look very pretty and are the best way to wear your hair on the Special day if you have medium hair. Normal buns are so Old Fashioned and these look pretty without looking too perfect. This Taylor swift messy bun is all about loose unruly curls. The hair has been parted in the side and the lower parts have been curled. The curls are then loosely tied together into a big messy bun with lots of Bobby pins. If you are confident to wear your hair this way use lots of bobby pins or hair pins to keep the curls in place. Add a pretty head-band too if you want some bling. The loose bangs in the front have been curled away from the face and secured with hair pins so that the front of the face is not covered with hair. This messy bun is great for special occasion like Weddings. In this hairstyle the hairs are parted into small sections and curled. The hair is pulled back and then rolled into a rope braid. The rope braid is then rolled into a messy bun and then secured with lots of bobby pins. This side swept low messy bun is really pretty with the hair being pulled away from the face in small sections. Then the hair is rolled into a messy bun and the hair are kept loose. The loose hair are kept open and an extra layer of shine hair spray has been added. 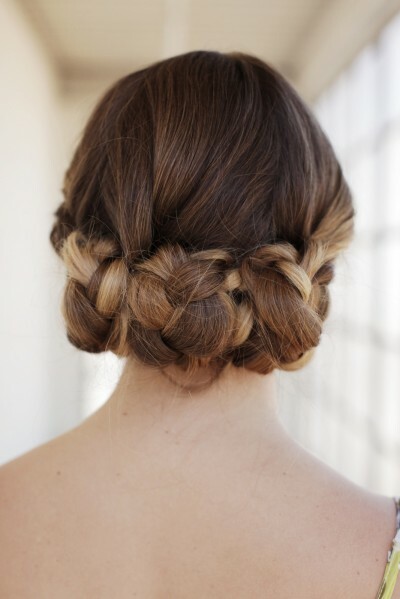 This Braided high ballerina bun looks very pretty. The hair has been tied in a low braid and then the hair has been tied in a high Ballerina Bun. 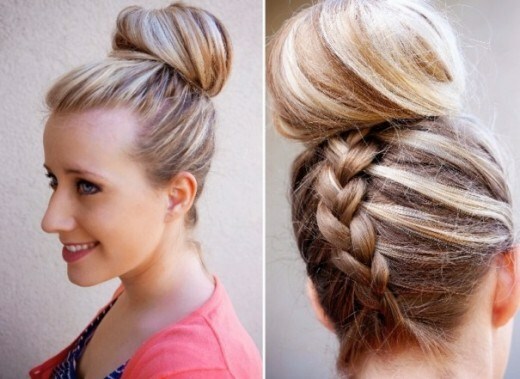 The ballerina bun is messy yet looks pretty with blonde highlights. This braided Twist and Pin low bun is great for any occasion . The low bun has been done with twist technique . The low bun with highlights add to its beauty. This is perfect for Bridesmaids and will be best for medium length hair. braided headband styles are becoming quite popular and if the wedding is going to be a summer or spring wedding with lots of flowers choose this Hairstyle . a braided headband looks beautiful with small floral hair pins . The front bangs are loosely tucked in and tied with the hair at the back. Some small bangs are loosely curled and left open. Long hair needs to be flaunted and what better day to flaunt it than at that special day you will get some wonderful attention. Keep your hair in curls or secure it in a headband and your long hair is all set for the Big day . Long hair should be showed off and what better day than the day you are going to attract special attention as a Bridesmaid. This curly messy hair updo looks natural yet attractive. The hair is separated in small sections and then curled. If you don’t want to tie your hair up and let it stay open then this hairstyle is perfect for you. To get this look simply side part your hair and make it into a low side pony-tail and top it off with a large flower hair clip at the side. If you use hair ties be sure to cover it with by taking a small strand of hair and wrapping it around the hair tie to conceal it. The open part can be loosely curled in large sections. This beautiful and cute hairstyle is very simple to do and will take no special accessories. Just middle part your hair and loosely tie it into a low ponytail. Keep the front bangs looks and add a pearl studded hair band for that added oomph. You can use second day hair for this hairstyle and can simply lightly straighten the front past and leave the rest of the hair as it naturally is. A puff looks very elegant and pretty on any special day. If puff is your style then choose this beautiful hairstyle. Use the front part of the hair to make a medium sized puff at the front of the scalp and let the other part remain open. Curl the open parts in loose curls and away from the face. For added shine spray on some shine hairspray. Flower hair pins and accessories are a perfect way to add that special touch to your simple or boring hairstyle . This simple hairstyle is easy to recreate. Tease the front section of hair to add volume to the front part of the hair. The hair is then tied in the back and the remaining part has been curled in strong and tight curls. This small cute hairstyle looks very cute and is ideal if you have short hair . If you have a short bob hairstyle this look will be perfect for you. The hair is left as it is and a crystal studded floral band is added to the hair. This messy updo with hair band is very cute and attractive. The messy hair has been tucked into a low messy bun and then two crystal studded hair bands have been added to add a touch of sparkle to the hair. medium length hair is great for trying out many hairstyles or to be left open. We have some easy medium length bridesmaid hairstyles for you to consider. 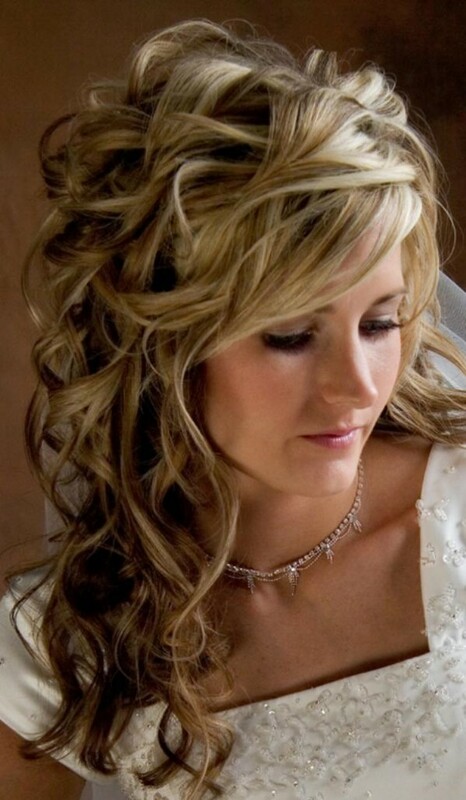 This curly medium length hairstyle is very easy to do and it’s even easier to carry. The hair has been separated into large sections an d then the sections are curled outwards. The front bangs have been straightened to let them fall onto the forehead. This messy hairstyle takes no effort at all to recreate. The hair has been curled loosely using minimum heat. Then the hair has been brushed loosely to make the curls look natural. Then the hair has been left open. 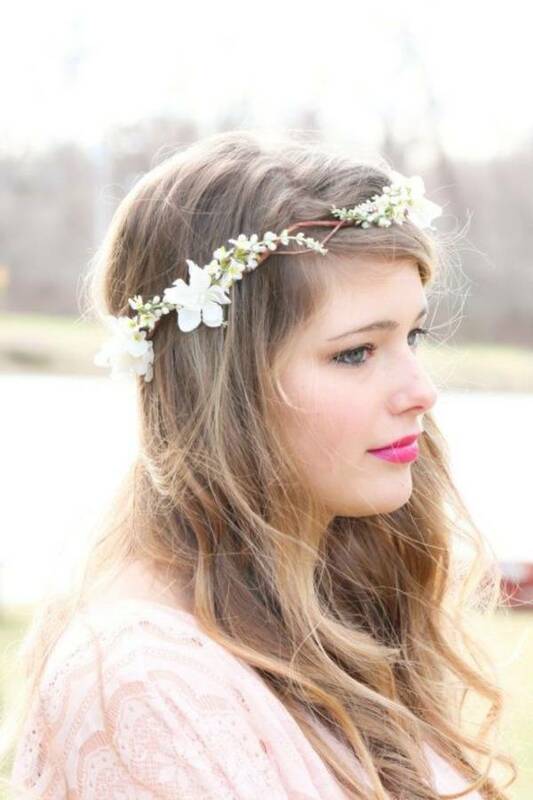 A flowery headband has been added to give the feel of a spring wedding. In this hairstyle the hair has been curled from the sides and below the headband. The hair has been kept wavy on the top part and then the rest of the hair has been curled away from the face. If you have medium length hair and want to keep it open then it’s better to keep it in a manageable hairstyle like this one. This hairstyle looks pretty with lots of curls and a pretty headband. The hair is curled in tight curls and left open. High buns look classy and are great for wedding occasions. This clean high bun looks very pretty and clean too. the Hair has been tucked up in a High ponytail and then it has been formed in to a high bun. All the hair has been tucked in and a coat of shine spray has been added for the clean look. This short messy updo looks very pretty with a thin crystal hairband. The hair has been curled in small sections and then it has been kept away from the face with the hair band. This princess hairstyle is so pretty and is very easy to sport too. the hair has been side parted and then the hair has been secured with a side hair pin and the open hair has been curled in outward loose curls. 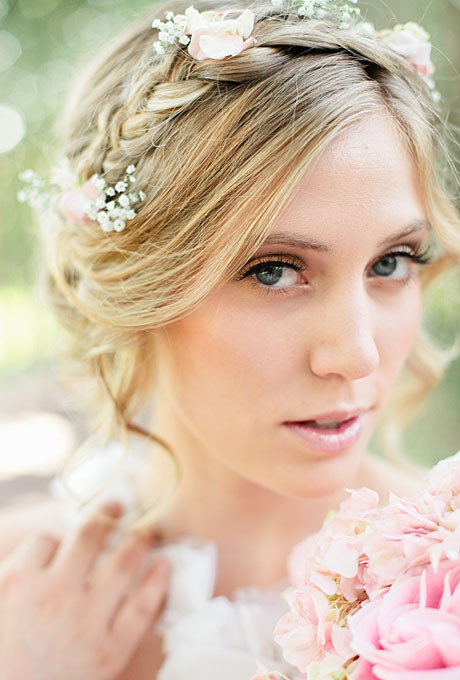 So these were some of the latest Bridesmaid hairstyles for you to consider while you get ready for that Special day. Most of the hairstyles need very less effort and only a bit of curling to be made complete. Easy and simple hairstyles look the most attractive. Do let us know if you try any of these styles and share with us your feedback below.